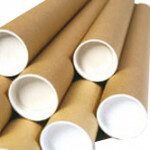 Brown stock postal tubes with white end. All of our stock postal tubes are sold in singles. More sizes of tubes available upon request. A0 Postal Tubes Tube size 885x50mm Sold in singles Suitable for A0 documen..
A1 Postal Tubes Tube size 630x50mm Sold in singles Suitable for A1..
A2 Postal Tubes Tube size 460x50mm Sold in singles Suitable for A2..
A3 A4 Postal Tubes Tube size 330x50mm Sold in singles Suitable for..